Research has shown that your muscles are stronger in the eccentric (lengthening) phase of a movement, compared to the concentric (shortening) phase of a movement. Changing pace or direction quickly can be achieved by first decelerating (eccentric) followed by an explosive movement (concentric), the longer you stretch a muscle the more tension it builds, thus the more force it generates off the rebound. For instance, if you stretch an elastic band like you are going to shoot it at something, the further the target the more you will tend to stretch it. This is because the longer the band, the greater tension it has, thus more force is generated to propel that band forward. Muscles work like elastic bands attached to sticks. A good example of an “elite” decelerator in the NBA is James Harden of the Houston Rockets. After coming off a historical season in the NBA, Marcus Elliot at P3 Applied Sports Science wanted to know exactly why Harden is so dominant. Turns out he has the ability to decelerate faster than his opponents, which gives him an advantage on the court by enabling him to change pace frequently, and weave through opponents on the way to the hoop. Therefore, it is important to incorporate eccentric training into sport performance programs. Eccentric overloading – What is it? During regular strength training, the eccentric load is limited by how much the concentric phase can lift. Therefore, eccentric overloading rarely occurs and thus loses its efficiency. While eccentric training can also be done by focusing on the lowering or lengthening phase of the muscle (negative training), this is often unsafe as the likelihood of injury rises tremendously, especially when no spotter (another person who is not performing the lift) is present. Repetition maximum (RM) is the maximum amount of weight that can be performed at a given number of reps. For instance, if an athlete’s 1RM for squats is 100lbs, they will only be able to perform 1 rep of 100lbs on the squat exercise and fail the succeeding rep. While eccentric training may be performed with regular weights such as free-weights, kettle-bells, and barbells, it is often considered to be unsafe as eccentric training would typically involve lifting more than the 1RM (<100% of 1RM). Therefore, in order for it to be safe, a spotter, is needed to assist on the concentric part of the exercise. How to Achieve Eccentric Overloading Safely? Eccentric overloading can be achieved through the use of the kBox, a piece of flywheel training equipment that is being used in the NBA, NCAA, and other professional sports. The kBox achieves eccentric overloading to occur by causing the force in the eccentric portion of a movement to be more than the force in the concentric part through the use of the flywheel. For example, if an athlete exerts 100N of force into the up phase of a squat (concentric), the force pulling the athlete in the down phase of a squat (eccentric) would equal 100N PLUS the force (measured in inertia) of the flywheel. In cases where the athlete is unable to perform another repetition safely, a quick release trigger on the vest can be used to safely abort the exercise. Here is a video of our head strength and conditioning coach, Sean Del Ben, performing over speed kBox squats. By using the barbell to pull himself up in addition to using his legs, the amount of concentric force increases substantially, thus giving him a more efficient overload in a short amount of time. Check out our Saltus Instagram page -> @saltusperformance for more videos and follow us for clips of our sessions. The eccentric portion of a movement is typically limited by the concentric phase. For instance, referring back to the YouTube video, the person performing the bench press was able to control the weight going down (eccentric phase), but struggled to get it up without the help of the spotter (concentric phase). This further proves the science behind the fact that a person is typically stronger when their muscles are lengthening (eccentric phase). Youth Development – Kids are able to gain knowledge on basic control of their body through focusing on the lowering aspect of a certain movement rather than how many reps they can do. Performing 3×5 eccentric reps builds more strength faster than “fooling around with bands”. Bands are great if used carefully but partner-assisted eccentrics may also be used to develop team culture and focus on body control. 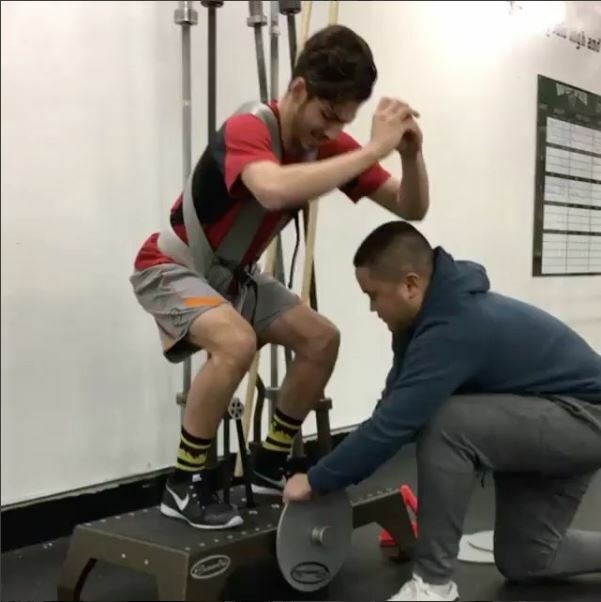 Rehabilitation – Once you are able to bear weight on the injured leg following an ACL surgery, the most important thing is to focus on regaining mobility (range of motion, ROM), and start the remodeling process within the injured tissue. Some research has shown that eccentric training stimulates Insulin Growth Factor-1 (IGF-1). IGF-1 stimulates growth throughout the body, especially in skeletal muscles, cartilage and bone. However, always proceed with caution, and do not get too aggressive with the remodeling of the tissue as rehabilitation progress should be a progression instead of a regression. These are just 2 of many examples provided by Carl Valle, who is the author of an article at Freelap USA, however the main idea is that eccentric training is suitable for anyone at any age and any level. Eccentric training/overloading is a way to improve sport performance for anyone at any level. However, keep in mind that eccentric training must be performed safely, and planned carefully in order to minimize injuries and DOMS respectively. Think of eccentric training as gaining performance and durability in the long run rather than looking for immediate gains.